One of the first things I got when I arrived in Japan was a Nikuman (pork bun). The taste was unlike anything I had before (well, not counting my 2008 trip, because a Nikuman was one of the things I wanted as soon as I got back). The semi-sweet minced meat mixture, the fluffy warm bun, the light squishyness that it offered, and the smell - I wish that the internet has smell-o-vision. But, alas, it does not. So, take my word that a Nikuman is a great little treat! Many manga and anime have nikuman in them, including a few of Keat's favorites such as Tsubasa: Reservoir Chronicle and xxxHolic (well, it's an animated magical rabbit-like creature, but a character in Tsubasa nicknames it "pork bun"). Even though you can get Nikuman at restaurants and convenience stores (well, in Japan), we didn't know that we could microwave our own! 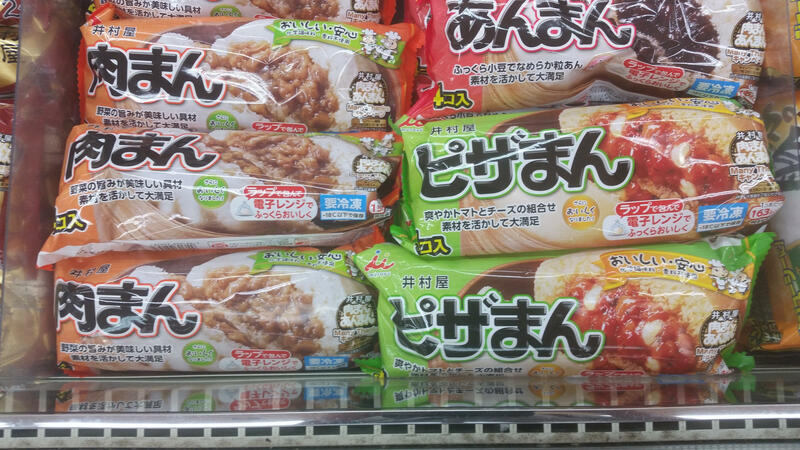 When we shopped at our local grocery store, we saw multiple microwavable nikuman available! What did we do? We picked up 2: a regular and a pizza one. In this video, we dissect a nikuman that we purchased from one of our local convenience stores, and then microwave our own and compare them. Neither of us had the pizza one before, so that was an adventure! Overall, the microwave nikuman are great if you're willing to wait 1-2 minutes instead of walking to your local convenience store. Although they are a bit smaller than the one we got a the store, they're still pretty good snack foods. We recommend these, if you can find them. Otherwise, just pay the ¥100 at the local convenience store to get a (semi) fresh one.